Many people have been focusing on the upcoming National Policy Institute conference as this makes up much of the intellectual core of the white nationalist movement in the United States. NPI, which is run by Richard Spencer, has brought together some of the most popular pseudo-intellectuals and fringe speakers to pull at their central theme, “The Identity and Spirit of Our People.” This theme is almost identical to all of their other ones, yet it seems like the veneer of respectability they crafted so thoroughly is slipping a little more every year. That mirage of academia is, however, still very much in tact for the H.L. Mencken Club. This conference is not one that you will likely have heard about as it is even more insular than the NPI yearly conference, but it attracts largely the same crowd. Before Richard Spencer went on to take over NPI and start its regular conference, he was still busy editing the pan-far-right Alternative Right website. During this period he was involved with the H.L. Mencken Club, which brings together academic reactionaries from around the world. In years past, the Club hosted speakers on a range of subjects like why entering WWII was a disaster, why we need to reclaim a “WASP elite,” and the importance of eugenics. Like NPI, there tends to be a common acceptance of scientific racist notions like Human Biological Diversity and the need for white identity, yet they have worked hard to continue to serve a very particular audience. 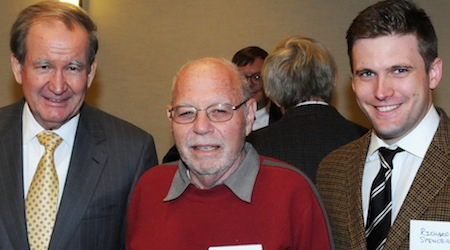 Pat Buchanan(left), Paul Gottfried(center), and Richard Spencer(right), at a previous H.L. Mencken Club conference. The concept of the H.L. Mencken Club may seem even too fringe for their movement as their ranks are not made up of PhD’s ready to publish papers on 19th century biohistory. This really is not the point, however, as what they are looking for is to reclaim an intellectual tradition that lends the far-right the same sense of legitimacy as many academic left ideas have. To do this, the H.L. 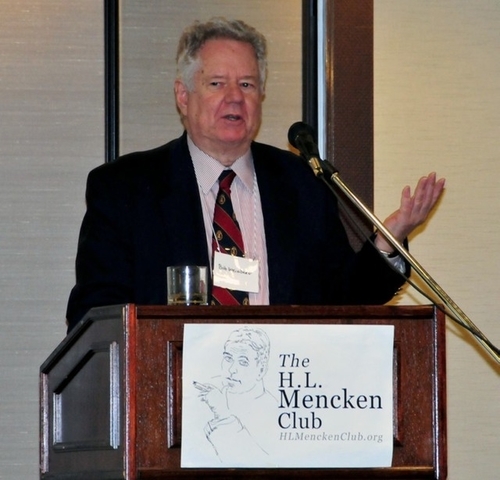 Mencken Club really prides itself on its elitism, though you will notice if you look through its ranks and speeches that it is a stretch to say that there is the same intellectual depth here that you would find at most academic conferences. There simply is not the same philosophical and critical background for this narrow range of racist ideas as they would like, so they are going to at least try to build the veneer of it. The conference itself requires that “Gentlemen wear suits and ties,” a point that highlights how silly this charade is. The conference is largely organized by Paul Gottfried, who was best associated with Paleoconservatism in the 1980s until he was generally ousted from the mainstream conservative movement for his ideas on racial differences in intelligence. He continued to publish regularly and associate with the fringes of the right, and often is there welcoming fellow racists who are finally exposed in their Republican strongholds. People like Robert Weissberg, John Derbyshire, Peter Brimelow, and Pat Buchanan, have all been ushered in the Club when being kicked out of their regular movement gigs at places like National Review. In the past, Richard Spencer has given talks on right-wing elites of the past, a defense of “decadence,” and the need for mixing conservationism with eugenics and racial nationalism. When looking at this year’s line-up, there is a clear sign that a certain core of white nationalist intellectuals are still trying to maintain relevance. Gottfried will be hosting a panel called “Elitism and Politics” that will feature Bob Weissberg, who people will know as one of the few Jewish speakers at American Renaissance conferences, and will likely try to work in some discussion of race and IQ. Weissberg has made a name for himself in white nationalist circles for his Darwinist language about racial minorities, accusing African American of everything from having sub-normal intelligence to being genetically prone towards violence. Next, anti-immigration fanatic Peter Brimelow(who, ironically, is an immigrant), the founder of the racist website VDare, will continue the conference’s theme of elitism by looking at it within a socio-economic context. We will also be seeing Keith Preston, who is speaking at the National Policy Institute just a week prior, and will be here with one of the most bland and innocuous titles possible: “The Alliance of Transnational Capitalism and the Managerial Therapeutic State.” We recently published a blog confronting Preston’s claims that he is still an anarchist, but his direct support of fascist politics and organized racists exposes him very clearly. The conference is certain to draw many of the same constituents as the National Policy Institute, but its proximity to the NPI conference and the fact that Richard Spencer is no longer involved may suggest a rift between the two forming. The “white unity” that Spencer often calls for seems almost impossible in the white nationalist subculture, which is mainly made up of infighting and internet raving. Now that Paul Gottfried left his teaching position at Elizabethtown College in Pennsylvania, where his tenured position insulated him from blow back of his support for fascist politics. The Mencken Club was always his pet project, and he took it from a more generic right-wing philosophy conference to the insular and openly racialist project it is today. Because of certain “far-right celebrities” like Peter Brimelow on the panels, it may be able to drum up the opposition it deserves. In previous years, organizations like the Southern Poverty Law Center and the Anti-Defamation League could not quite agree if the Club was a “hate group,” but at this point the Club has made itself an out-of-the-closet organization for the racialized radical right. Part of this indecision comes from the level of academic discourse that hides the rhetoric, and the quiet face of Paul Gottfried, now in his mid 70s, is a part as well. Their 2015 conference is specifically about a call for a new “elite,” racially, politically, socially, and economically. This is a call to specify a new “aristocracy;” a rule class that was not elected and is enforced through structural inequality. “Race realists” make up both the panelists and the audience, so it is clear who the “elite” is they hope to arrive. It is up to Anti-Fascists and anti-racist organizers to challenge the H.L. Mencken Club and to shake up their pseudo-academic festival of white self-congradulation in a way that they never would have expected. Further alienate people like Gottfried and Weissberg, disallow them to hide their fascist new-vision under academic double speak, and use this as a rallying point to build a mass movement against the creeping fascism that is coming from fear and crisis in the west. Academia has always been a place that they fight a battle over ideas, and we have the ability to stop their attempts to reverse racial progress. The Mencken Club seems to know that their presence is rarely welcome in communities, so, while they are posting that you can get a group rate deal on hotels where they are hosting it, they have yet to post the details about exactly where the conference is. They also note on their website that “The H.L. Mencken Club reserves the right to withdraw or deny admission to anyone who seeks to disrupt the conference or whose presence is deemed a nuisance.” We will be waiting to see the rest of the specifics for the conference and share them widely, so until then a flying squad can be organized that can head to the location when it is made available. There meetings have been in Baltimore, and it looks like this is not going to change, so expect it to be in the more upper class area of the city, a short drive away from Washington D.C.